PURPOSE Juicing doesn’t always mean an intense cleansing program that avoids solid food. If you feel your body is not ready to eliminate solid foods, then don’t! Our Juice n’ Soup package includes one juice as breakfast and one soup as dinner daily, over three days. Our cold-pressed juices are packed with cell-nourishing, health-enhancing goodness and our hearty soups keep you light and energized! ACTION With this program, you will enjoy a total of 3 delicious juices and 3 hearty soups over 3 days. Start each day with one juice as breakfast, and then indulge in one soup as dinner. 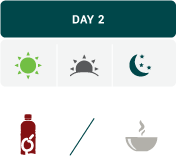 Each juice and each soup is labeled so that you can consume the right juice/soup at the right time (Day 1, Day 2, Day 3). Make sure your juicing days are balanced with unprocessed food, lean protein, legumes, vegetables, and fruits. 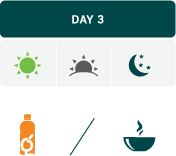 Day 1/ Day 2/ Day 3: one juice as breakfast and one soup as dinner.